The Diego Lamp Table with Wood Parquetry Top was designed for use in tight spaces where a small table may be needed. Robust metal construction ensures stability. The surface of the metal is beautifully textured, as though it was sculpted by an artist. It is made by a casting process. Molten metal is poured into a sand mold which can only be used once. The rough casting is then filed and smoothed by hand. This is a long and laborious process requiring painstaking attention to detail. Such surface texture was widely used by Diego Giacometti (1902 – 1985) on his furniture and lighting creations. As a tribute to this gifted artist, the table was named for him. The wood parquetry top is hand-made in rosewood. The table base is offered in a wide range of finishes. The top is available in a variety of wood stains. 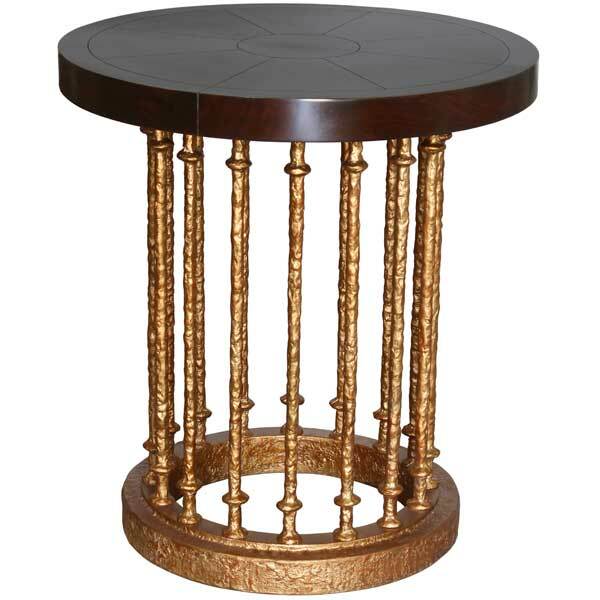 This elegant little table was designed by award-winning designer Shah Gilani, ASFD. Custom sizing is available.